Pain in the sealed tooth is a fairly common phenomenon. Sometimes it takes a couple of hours after treatment, sometimes a few days, and in some cases can linger for a long time. Causes of pain in the filled teeth can be different. The onset of pain after treatment of the tooth depends on what disease the patient appealed to the dentist. After treatment of dental caries and the sealing of the pain may occur due to violations of technology sealing. This is especially true for broad and deep pathology, as many tissues of the dental cavity during drilling severely injured. So they returned to a relatively normal state, it takes time. The nature of pain sealed teeth can vary from slight response to cold or heat to acute pain symptoms. If the pain in the tooth appeared suddenly, it pulses and grows, and at night is enhanced, it is most likely acute pulpitis. If the symptom of pain appears after eating hot food, it can be assumed that developing chronic pulpitis. In this case, the tooth may become ill immediately, but after a while after thermal treatment. Pain concentrated around one tooth. In any situation when he got sealed tooth, as soon as possible to go to the dentist to remove the inflamed nerve (pulp). The seal is in this case removed, then remove the pulp, sealed each channel of the tooth and again put the seal. If the inflammation has not gone too far, the possibility of partial preservation of the pulp. In this case, the tooth less susceptible to degradation and is longer its owner. In some cases, the sealed tooth hurts with pressure or sensitivity to hot and cold foods increases. Sometimes it can hurt and without external influences. The cause of these pains can be nedoshivina or drying before sealing the tooth cavity. If the surface is excessively dried, which is located in the upper layer of the tooth nerve endings are irritated, damaged and can even die. When the death of the developing pulpitis. If the pain is caused by irritation, over time the tooth will be saturated with moisture, and the pain will be. This process can take up to two weeks. 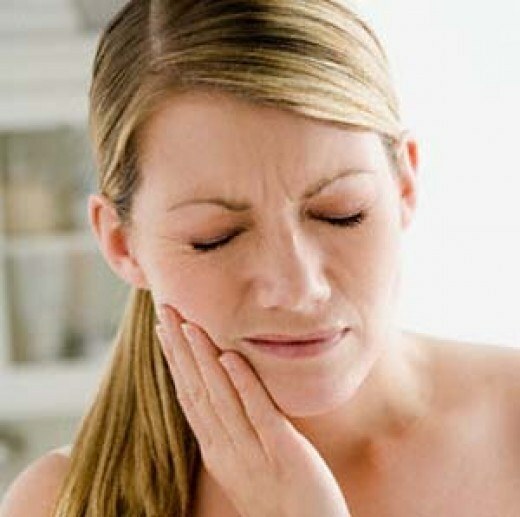 If after two weeks the pain in the cured tooth is not abated, it is necessary to turn to dentist. Inadequate air drying of the dental cavity after the imposition of the seal may appear small areas vacuum. They irritate the nerves of the tooth and cause pain. In this case you need to replace the seal. Very often after a visit to the dentist , the tooth continues to hurt. This may be due to several reasons. The sensation of pain for 4-5 hours after installation of the seal is quite normal, so the nerve endings react to the manipulation in the treatment of. If the pain continues, you need to consult a doctor. If the pain is very strong, and the dental clinic is already closed, you can rinse your mouth with salt and take pain medications. Pain under a temporary filling completely normal reaction to a medicine that is put before a removal procedure nerve.If the filled tooth aches quite a long time, then the cause of the pain is the re-emergence of caries. This situation arises if the doctor not treated the affected tooth with a drill and filled.After sealing the toothand you may receive a pulpitis or inflammation of the nerve, if it is not removed, and the caries was deep enough. You need to go to the dentist. He will remove the seal, clean the cavity and remove the pulp. If the doctor feels that the tooth can be saved, it will prescribe anti-inflammatory drugs and antibiotics. Just put under seal may develop periodontitis. The patient will experience pain. To resolve this issue by re - treatment. The dentist removes the supplied seal, rassverlivajut channel, provides a cure and puts a temporary filling. After a week, the temporary filling is removed, the nerve is removed and a second seal.Also , the tooth may be sore after the treatment, if the cyst. The doctor cuts the gum and removes the bag. Laser cyst removal is performed without incision. In some cases, if the cyst is large enough , the tooth is not possible to keep. The doctor performs the removal and cleans the cyst with the help of tools.Pain after treatment may cause an allergic reaction to the material of the seal. Relief is only one to remove the seal and fill the tooth with another material.Even if after the treatment the toothand the patient did not bother, it is necessary in one week to see the doctor for inspection and, if necessary, to the correction of the seal.